BHP Billiton has been operating in TT for 22 years, and, its president Vincent Pereira hopes, will be here for at least 22 more. “Trinidad is a great place to do business. We’ve been quite successful here so that’s always good. And I think the environment itself is good because clearly it has a century-long established industry,” Pereira said. 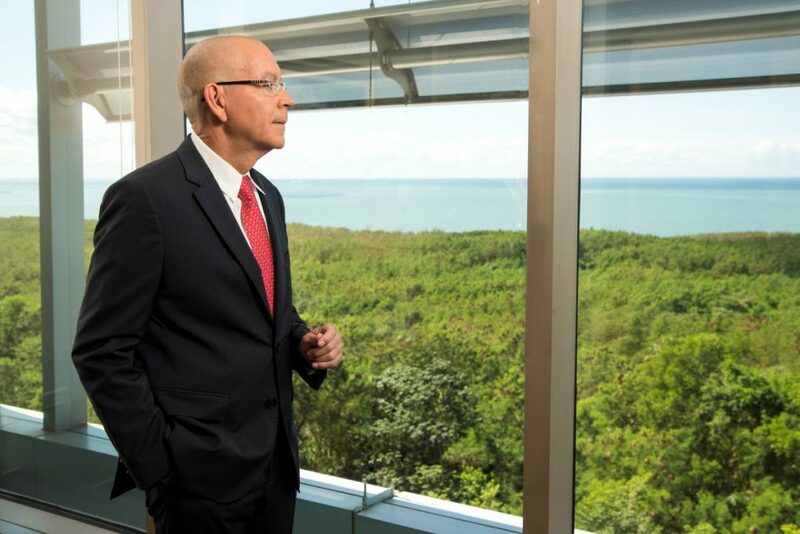 Pereira spoke to Business Day at his Invaders Bay office, Mucurapo, overlooking the Gulf of Paria. He’s a soft-spoken man and one of the most prominent voices in energy in TT, having served a two-year stint as president of the TT Energy Chamber. Headquartered in Melbourne, Australia, BHP Billiton’s success in TT is legendary. In 1999, just three years after getting its first licence to drill, the world’s biggest mining company struck oil in the Angostura field, off the east coast – the first major oil find in TT for 30 years, with estimates close to 160 million barrels of oil and up to 1.75 trillion cubic feet of natural gas. “The harder we work the luckier we get. It’s one of those things,” Pereira, a Trinidadian, said, laughing. “We’re an oil and gas company all over the world, certainly in the deepwater. We came here with a bias towards oil but the first thing we want to do in the deepwater, wherever we’re looking, is find hydrocarbons. When we find hydrocarbons, it could be oil or gas and then we’ll figure out what to do and to be quite honest in block 2 in Angostura what we found first was gas. We kept looking and then found oil so we started off then as an oil company with a longer-term plan that we are going to transition to gas,” he said. 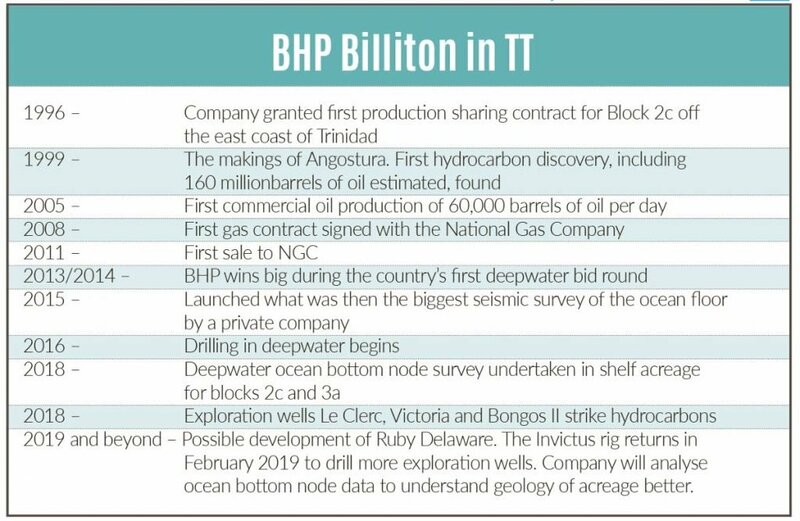 BHP also famously reinvigorated the prospects for TT’s deepwater potential, when in 2013/2014, the company won the rights for all the deepwater blocks that went up for option in TT’s first deepwater bid round. “We’ve been interested in deepwter in TT for a very long time but not something we could figure out commercially. It was prospective, an area that needed to be explored but the above ground things were a little harder,” Pereira said. That all changed in that 2012, when the Government introduced an incentive scheme that made it more viable for the company to invest, providing a better business outlook that made the risk worthwhile. “We could actually see our way forward at that point where we could generate a return that was commensurate with the risk we were about to take, so we went after it, and we went after it relatively aggressively because we felt pretty good about it,” Pereira said. 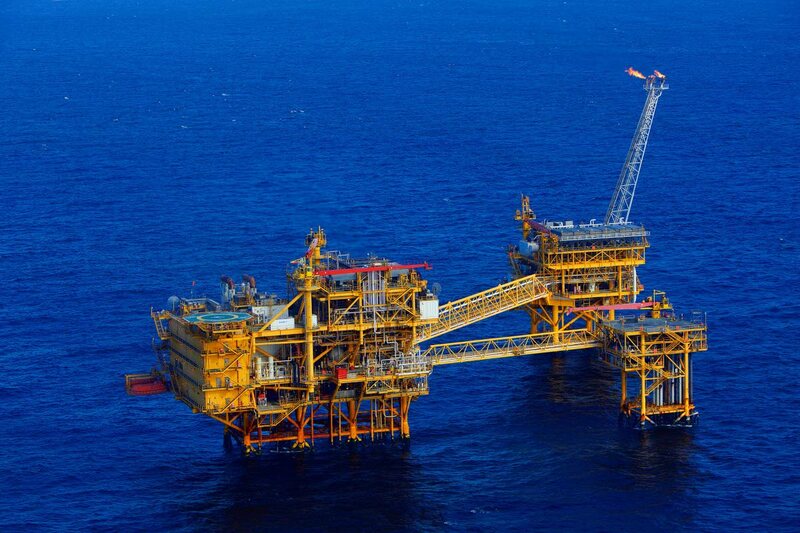 BHP is the majority operator of the deepwater blocks, some it operates on its own, and others with partners BPTT and Shell. 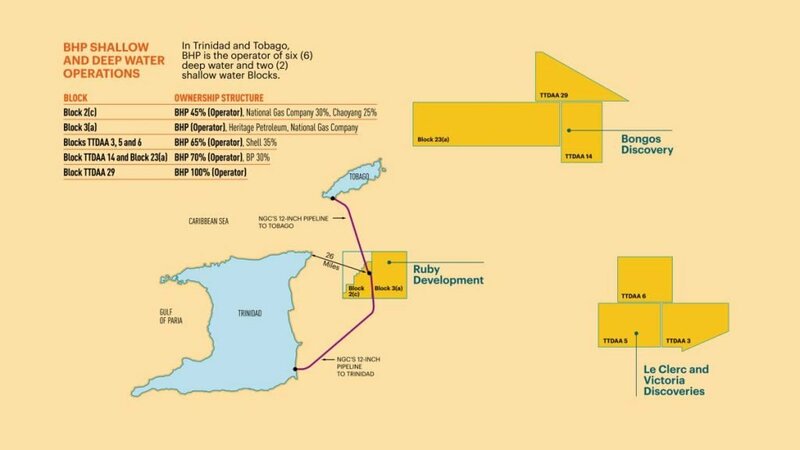 The government also has a stake, through production sharing contracts with either Petrotrin (now Trinidad Petroleum Holding Co Ltd) or the National Gas Company. “A good friend of mine once told me if you want go fast you go by yourself. If you want to go far, you go together and we have really good partners in deepwater, and you’re really seeing the synergies of that at work. That’s allowing us to explore the way we are. And some of that is reflected in the results so far. We’ve drilled five wells and discovered hydrocarbons in three. That’s quite an outstanding ratio for frontier deep water exploration. I’m quite proud about that. We still have a long way to go. This is not a short game by any means and we still have to drill more wells to understand the area,” he said. For deepwater to work from a commercial perspective, Pereira said, it has to be a very large resource. “The costs are extremely high to develop so you have to find a significant amount to develop. We went into this knowing it was tier one ­– large and expandable and we are very encouraged by what we’ve seen so far and certainly encouraged to keep looking,” he said. Thus far, the company is in its exploration phase, but Pereira assured this was all part of the usual timeline. “If you are fortunate to find hydrocarbons there tends to be five to seven years before you have production. It’s a long wavelength that unfolds over many years and requires significant development,” he said. Last year, the company announced finds in its Le Clerc and Victoria fields, both in the southern acreage in within the same area, Pereira said, as the company was trying to understand the basin more. Le Clerc was first, then a second well that was unsuccessful, then Victoria. Bongos is in the northern acreage. “There’s still a few steps ahead. We have to drill a few more wells in that area to understand it better and the extent of the resource. Once you know that, you can start to understand it better. In this industry, you tend to invest a significant amount of money before you get even one dollar of return. That’s an important consideration,” he said. He did, though, elaborate on the company’s plans for the near term. “We have three big things exciting us right now. We have a shelf development, Ruby Delaware, we are studying very hard and, hopefully, we can produce from in the near future. Once that is sanctioned, and we hope it will be in 2019, then we expect production in 2021. So that’s a big project for us, which we will tie back to Angostura in Block 2c. "We are continuing to drill deepwater exploration wells. The Invictus rig is due back here in February and that will be another multi-well programme. And then we’ve recently done an ocean bottom node survey last year and we are now starting to analyse the data. Why is that exciting? One is that it’s giving us a much better picture of the sub-surface, something we’ve been wanting for a while. Hopefully, what that will do is show up areas of the shelf that are either new areas for us that we haven’t drilled as yet, and areas we may have not seen before, that has us really exciting. Those three big things coming together is a pretty significant investment profile for us. Hopefully, we will be successful in all three,” Pereira said. And with that, Pereira is positive about the energy industry outlook well into the future. “This is an industry that has been around for many years and will continue for many more. We haven’t explored all of TT from a hydrocarbon perspective. There are big challenges for the industry from a global perspective because climate change is a big issue and we are a big part of that, so how we decarbonise energy is very important thing for the future. But all of that said oil and gas are going to remain a significant part of the energy mix for decades so that future is one that certainly excites me,” he said. He has some concerns, though, especially regarding the country’s ease of doing business and its competitiveness. Projects compete for capital all over the world and TT operations need to have the most competitive projects, he said. He does believe, though, that it’s entirely possible for public and private partnerships and collaborations can find solutions for efficiency. “There’s a need on both sides. The people of TT deserve a fair return for the resource, and the company should deserve a fair return as well (for its risk). It's finding the balance where they intersect that needs to be competitive, including fiscal terms,” he said. The speed at which decisions are made are important and increasingly become more important, he added, because it impacts cycle time, and a project with a shorter cycle time tends to increase commercial terms and perform better. Education that keeps up with technology, for all workers in the industry, is also important, he added. Reply to "BHP predicts returns in deepwater blocks"